In the heart of old Paris, between the Louvre Museum and the Opera House, the hotel Marsollier Opera offers you its refined setting and the cosy comfort of its 28 rooms where everything has been planned for your relaxation. This stylish hotel was once home to the famous Oscar Wilde who lived there in 1899 and promises a pleasant and memorable Parisian stay. Hotel Louvre Marsollier Opera offers you its refined setting and the cosy comfort of its 28 rooms where everything has been planned for a relaxing stay. The rooms are fully equipped: air-conditioning, bathroom (shower or bath and WC, hairdryer) free internet WIFI access, direct dial phone, minibar, flat-screen TV with satellite (CNN, Eurosport, TVE, RAI, JSTV,...), radio and individual safety box. -1 child less than 2 years old free of charge. (Only possible in Large Double rooms ). No extra-child possible in standard rooms. Couple with child of more than 2 years old, please book triple room. 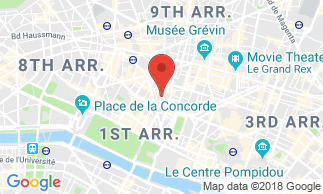 The hotel stands close to the business district and most prestigious Parisian monuments such as the Opera House, the Louvre Museum, Place Vendome and the famous department stores (Galeries Lafayette and Printemps). The neighbourhood, punctuated with sumptuous Haussmann style avenues is also filled with beautiful brasseries and fancy shops. A copious buffet breakfast will be served either in your room or in the cozy breakfast room. Breakfast is not included : 13 EUR per person.